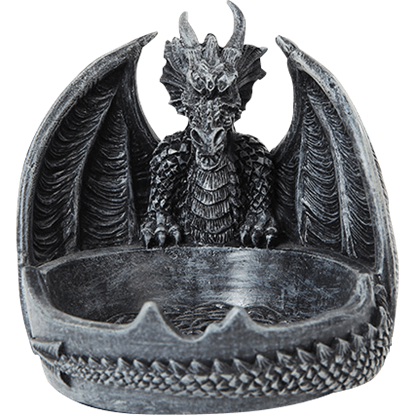 A dragon ashtray is a great way to add a touch of dragon style to your decor while also expanding on your collection of great dragon gear. 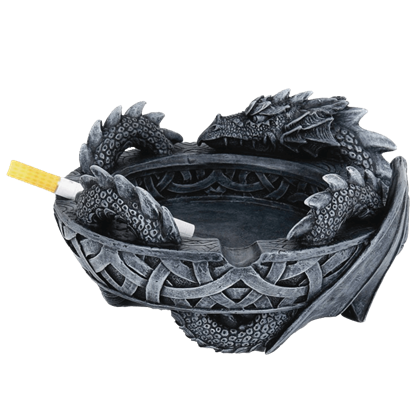 And do not forget that when your guests catch sight of one of these dragon ashtrays, they will be sure to comment on your unique fantasy style. 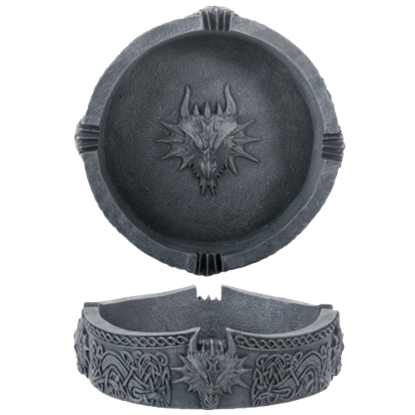 Our dragon ashtrays come in a wide variety of different designs and range in both shape and form. Many of them are impressive little displays that are worthy of being called collectibles. Even if you do not smoke, these ashtrays are great items to include in your decor, either as decorations or as trays for holding all manner of trinkets and essentials. Of course, being ashtrays, they are also perfect for their intended purpose, supporting cigarettes and holding ash. Some of our fantasy dragon ashtrays take the shape of a dragons tail, while others hold the ashes within the folds of a dragons wings. Others feature a traditional ashtray shape that has been infused with touches of true medieval and draconic style. 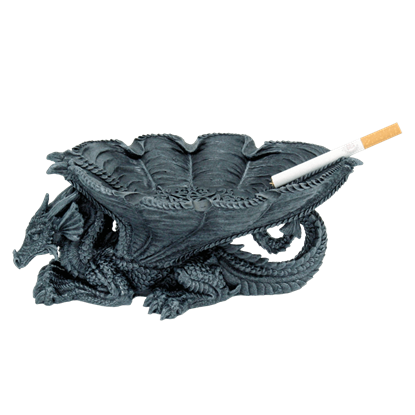 Best of all, our the dragon ashtrays are extremely affordable, which means that no matter your budget, you are bound to find an ashtray here that you can use, whether you are looking for a place to set your cigarette down or just looking for something unique to put on your coffee table. A dragon slayer from the silver screen once claimed that dragons fed on death and ash. If this is true, than the dragon on this Celtic Dragon Ashtray must be a happy one, because it is a good position to get a steady supply of ash! Acting as the perfect fusion of fantasy and function, the Celtic Dragon Ashtray is a great decor item or collectible that features a realistic and life-like dragon integrated seamlessly into the appearance of the fantasy ashtray. Capable of being used in a variety of ways, the Celtic Dragon Tray displays a fierce dragon overlooking a round bowl with Celtic patterning. Wings spread to each side of the dragon, and its tail curls around the edge of the tray. Every aspect of your home decor should reflect your unique tastes and personal style. 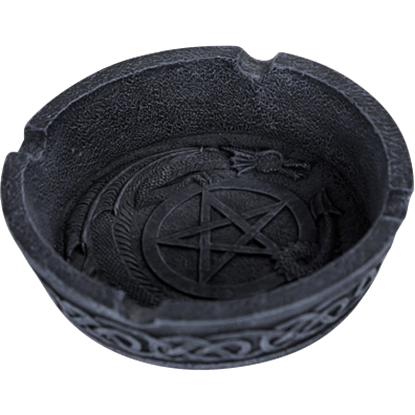 With both Wiccan and fantasy elements, the Dragon Pentagram Ashtray can be easily implemented into any design for its function and decoration. Fire-breathing creatures themselves, dragons are the perfect animal to keep around smoke because, well, it just makes sense! 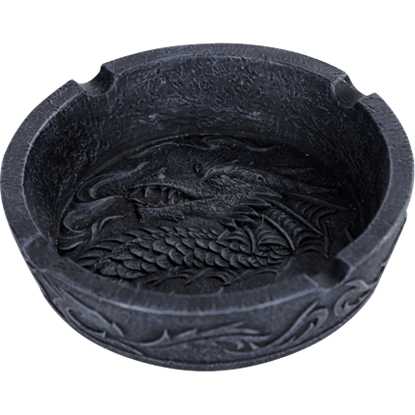 This Fiery Dragon Ashtray is a unique way to implement your love of dragons into every part of your home. As creatures of fire and brimstone, most dragons are not afraid to be around a bit of smoke. That makes them a perfect smoking companion, especially when they plan to be as helpful and useful as this Furled Wing Dragon Ashtray.